Disney’s Animal Kingdom was the first theme park built in an era when everyone had access to the internet. It was brought under scrutiny by not only organizations like People for the Ethical Treatment of Animals (PETA) but also fans and Disney enthusiasts who would hold this park up to enormously high standards. It would be only fitting, then, to give these prying eyes a chance to see the real work, experiences, and creations that awaited inside of the park. 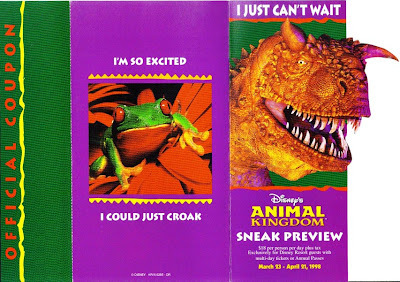 In the finest tradition of wanting to know what still needed work, what was a hit, and where the problems were going to form, Disney began offering honored guests a chance to be one of the first to experience Disney’s Animal Kingdom. Beginning on March 23, and running through April 21, 1998 Disney Resort guests who had annual passes or multi-day tickets could, for the optimally low fare of 18 dollars, take a stroll through Florida’s fourth-gate. 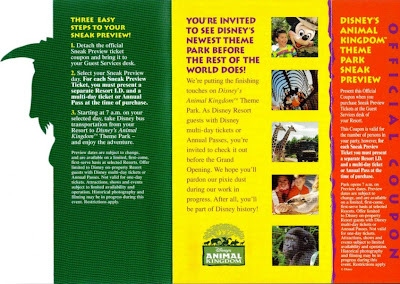 Advertising and coupons, such as the one presented here today, splashed bright colors and cheerful “guests” enjoying the various attractions and animals and attracted a number of the curious speculators who had been guessing and obtaining any information available since the park had been announced in 1995. While looked upon by some guests as a child-friendly park, Disney’s Animal Kingdom opened as not only a fourth theme park in Walt Disney World, but also a new voice for the conservation and preservation messages of the Walt Disney Company. As the park has continued, and does continue, to grow new adventures and messages have been added to entice guests. But, in the end, it is the beating heart of Disney’s Animal Kingdom that has always drawn the curious to take a closer look.